Silver 25 / 25th Anniversary Holographic Pennant Flag Banner / Bunting - 26ft Long. The reverse of the bunting is silver with a sparkle finish. A whopping 26 ft length of 16 triangular foil pennant flags for a milestone 25th anniversary / silver wedding celebration. The reverse of the bunting is silver with a sparkle finish. Suitable for both male & female. 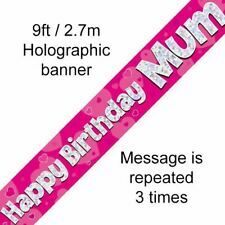 Ideal for parties - make an impact with this decoration! Give your party that finishing touch! Black & Silver Congrats Grad Foil Graduation Banner - Jumbo Length - 24ft / 7m Long. A massive 24ft / 7m long foil banner for a graduation celebration or party. This silver foil banner features the wording:Congrats Grad!with an image of a mortar board before the word Congrats. The banner is a whopping 25ft /7.6m Long. Banner length is approx: 25ft / 7.6m. This brightly coloured banner is decorated with the wording:Let's Boogie in brightly coloured letters with disco balls before & after the words. 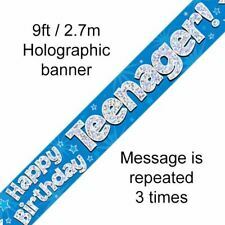 Brightly Coloured Party Holographic Pennant Flag Banner / Bunting - 26ft Long - Suitable for all Occasions. The reverse of the bunting is silver with a sparkle finish. A whopping 26 ft length of 16 triangular pennant flags in a brightly coloured stars design for your celebrations. 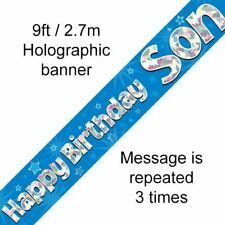 Happy Anniversary Holographic Banner Condition is New. Dispatched with Royal Mail 2nd Class Large Letter.